MakeSpace is a small but growing startup with a mission to provide innovative and affordable storage to New York City and eventually the entire country. Over the past couple of months, some of our largest competitors have taken notice of the new kid on the block. For a startup, that’s both a good thing and a scary thing. Good because it means you’re doing something right. Scary because it means that you’re David and Goliath now has you in his sights. I’m sharing our story, and a few thoughts about David(s) v. Goliath(s), because I think the startup community could use a good round of discussion on how growing companies handle these kinds of situations. Being in a Goliath’s crosshairs is stressful. I would have liked to read more about how others dealt with it — it would have helped me. This is our story (still in progress). There may be many others like it, but this one is ours. We hope to hear others. Our story starts with a legal nastygram. Just a month after our launch, we received a lawyer-drafted “cease and desist” threat, courtesy of Manhattan Mini Storage. It claimed we were engaging in (scary! lawyer words! important sounding!) “trademark infringement, unfair competition and false advertising, among other things….” The law firm that sent the letter, Kramer Levin, is an AmLaw 100 Firm…the kind the major corporations use when they’re suing each other. My initial reaction was, “I’m too busy to deal with this. I have to focus on delighting customers. I have to keep up good communication with investors. I have to hire the right team and establish the right culture.” I wanted to just make the problem go away. I was scared. Goliath had roared. I was ready to run. Luckily, I got some good advice to actually consult with a lawyer. I made the time. It was worth every penny to learn what my rights were. I stood my ground. Then came the advertising. Manhattan Mini Storage has an ad, that curiously matches our color scheme, and explicitly advises the public “not to trust the cloud” — part of our core slogan. (The potshot wasn’t even that original — Public Storage used the same shtick in a one minute national commercial.) Goliath was pounding his chest. But this time, I wasn’t afraid. Rather than acknowledge that Manhattan Mini Storage is worried about competition from us, Sank wants you to believe that they took out an ad that was playing on the virtual data that people have lost in the cloud. But Manhattan Mini Storage doesn’t offer an alternative solution to virtual data. They let you store your physical belongings, not backups of your emails. It’s like a company that makes rain boots telling you not to trust your umbrella. It makes no sense. I’ve received several emails from family members, other entrepreneurs, and investors asking if I was worried or scared about these ad campaigns. And to tell you the truth I’m not. Not even a little. In fact I’m more determined now than ever, and Manhattan Mini Storage’s outright refusal to admit what the advertising is really about has convinced me that we’re on the right path. It’s convinced me that Goliaths roar when they’re afraid. Afraid because a David is doing something right. The key is to be rational and not let the fear win. We aren’t. In fact, we’re kind of flattered and keeping focused on our vision, our operations, and most importantly, our customers. Working on a startup, time and attention (or mental bandwidth) are your most valuable assets. Goliaths have a team of people. A few hours to cause you a little heartburn doesn’t cost them much. For a David, those are hours that might otherwise go to trying to build a business. (Or more likely: hours of sleep that a founder loses). This is Goliath’s biggest advantage — that you may be tempted to ignore, run, or cave. Or worse, that you’ll be distracted from your core mission. The idea of tossing “fear, uncertainty, and doubt” at a new entrant is an old play. There are other ways of fighting back too. Especially once you have traction, you can also encourage your users to speak up on your behalf to let Goliath know you won’t go away without a fight. When Goliath is coming after you, it’s because you’re doing something right. Rather than be afraid, double down on what got you to where you are. Celerity: Davids are quick. Goliaths have bigger teams, and can devote more person-hours to the fight. But David can run circles around Goliath — startups don’t have design by committee. For whatever’s being considered or proposed, the employee responsible for “final approval” was probably in the room when it was brainstormed. (If she didn’t think of it herself.) You’ve got a small team, so use that as a strength to get things done quickly. For example, the MakeSpace street team campaign went from conception to execution in less than one month. At an established player, this could have taken a whole lot longer to get approval. No Sunk Costs: Davids tend not to have shiny suits of armor that they’ve spent countless hours polishing — or put another way, they’re not anchored to legacy systems and process that may be kludgy like Goliaths. When your system used to work, you may be tempted to try and make small fixes rather than address the market change. Davids are trying to build a system that works; not fix one that’s starting to break. In fact, that’s your advantage! The big guys have capital cost and business structures that can’t match innovative models. They can poke fun all they want. Perspective: Goliaths may quite literally be looking down at problems from 30,000 feet. Davids have a very different view. This can be a huge advantage for surprise. (you’re probably already taking them by surprise). An example: when you are juggling the needs of twenty million customers, you want your front line employees to respond to every piece of feedback, but at higher levels of the company, it’s natural to look at aggregate trends. But when you are focused on your first twenty users, all of the company is processing and reacting to every comment. As a result, the decision makers may have divergent views of the market. That said — even with these strengths, it’s important not to get cocky. Goliaths still have a lot of power and resources, and some are pretty nimble themselves. Believe in your own magic enough to be confident, but not that you actually believe it’s magic. It’s worked for IBM and Airbnb. I’m hoping it works for us too. My last point is that it’s not just the founders that have to understand what Goliath’s attacks really mean. The whole team should know. It can be a great motivator, because who doesn’t want to see the underdog win!? I’ve made it part of my job to make sure no one on Team MakeSpace is afraid of Goliath. I’ve noticed I’m not the only one that’s been energized by being in the crosshairs — the benefit of having roar-proofed the team. We know we have challenges ahead, but we’re having a great time and now more than ever feel like we’re all working with a common goal (p.s. we’re hiring!). 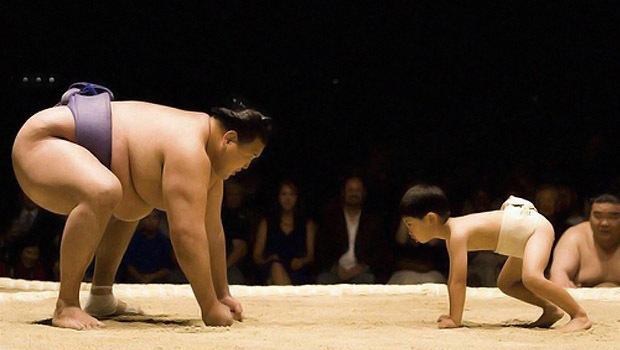 To all other entrepreneurs out there who are worried about being crushed by Goliath, don’t be. There’s a reason you’re being targeted….because you’re doing something right (so keep doing it!). The fact that someone wants to crush you is flattering. Let them “attack and want to burn you” (TIL it wasn’t Gandhi who said this). Don’t get distracted, don’t make decisions out of fear, and stay on the road to winning. You’ve got this. Thanks Willis Plummer, Mark Suster, David Lapter, Amy Snook, Josh Abrams, Rion Harmon, Rahul Gandhi, and Brad Rosen for reading drafts of this.